Scheduler scripts are a very recent addition to Windows Azure Mobile Services. This is a very nice feature that supports periodic background processing in your mobile service. As a reminder, in the original release of Windows Azure Mobile Services, the only opportunity to run any server-side work (in scripts) is when the client performs an operation on a table (select, insert, update, or delete). For any kind of periodic processing, you’d have to use an external solution or have a client ping one of your tables — a very ugly solution, as opposed to a scheduled script. When would you use scheduled scripts? To perform background processing on data uploaded by your users, or data that you retrieve from some external web services. For example, if you allow free text uploads, you might want to index the text for faster searching, or mine the text to detect interesting patterns. To prune unnecessary data from your tables, such as dead push channels (channels that represent devices that are no longer available, or devices where you app is no longer installed). But another very useful thing you can do with scheduled scripts is test your server-side code. As you write your server-side scripts, the only way to test them previously was to hit one of your tables with a CRUD operation. 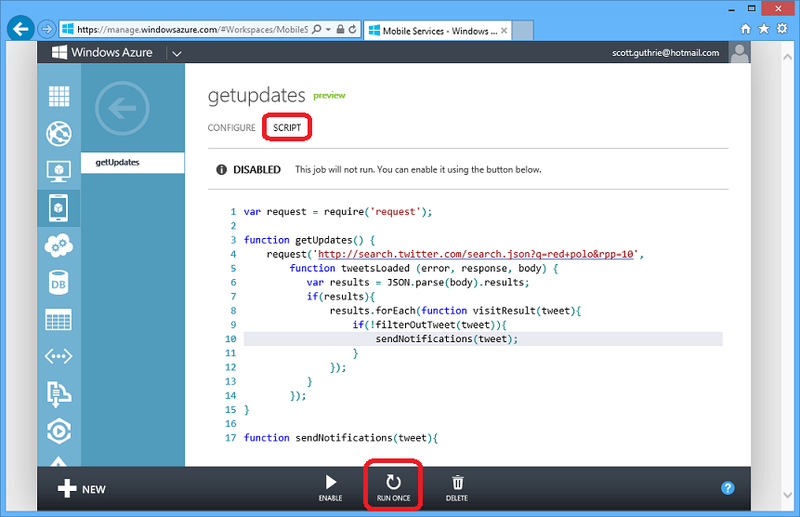 With scheduled scripts, you can run your script by clicking a button in the Windows Azure Management Portal. Image borrowed from Scott Guthrie’s blog. With the most recent command-line tool release to manage your Windows Azure Mobile Services, you can list, download, and upload your scheduler scripts from the command-line. Unfortunately, there’s no way at this point to invoke the scheduler script from the command-line tool, but you can easily test any script from the portal, as we’ve seen above.